It’s January and things are clearly not good. Payday looks like three months away and you have mouths to feed, fare, school fees and other bills to settle. Any coin you can save is completely worth it. That’s why as a mom, I’m letting you in on a little secret. 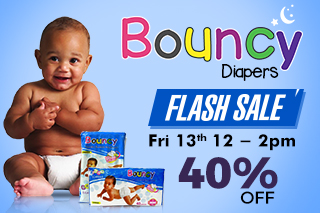 Jumia have a big flash sale on Bouncy Diapers tomorrow the 13th Jan, between 12 and 2PM. 40% off. We all know you need them diapers, and the discount even more! Click the banner above or simply visit the bouncy page on Jumia, bookmark, set a reminder on your phone and feel free to thank me later.